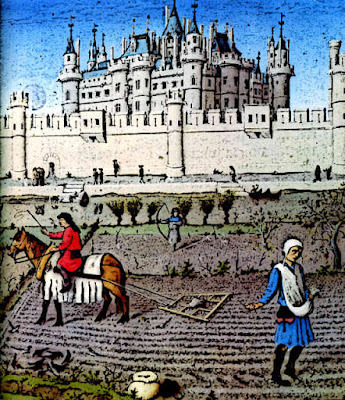 Medieval serfs working the land. No one can doubt the amazing success of Tsarist Russia in dissolving Romiosini and the Ecumenical Patriarchate. But this begs the question: how did the Russians receive this plan? The answer is: unfortunately from the example of the new Greek state, where the Europeans had inaugurated a similar design, which was applied by the Franks from the 9th century for the dissolution of Romiosini in the West. (15) What the Russians did in eastern Romiosini, approximately the same thing had been done by the Franks in western Romiosini. In order for the Roman serfs to forget that there existed a free eastern Romania, the Franks gave them the name "Greeks", the emperor of the Romans in Constantinople became the "emperor of the Greeks", and the eastern Patriarchates of the Romans became the "Patriarchates of the Greeks". At the same time the Franks called the first emperor of the Franks the "emperor of the Romans"(! ), they banished the Romans from the Patriarchate of Old Rome, and they called the Frankish pope the "Pope of the Romans", while keeping the name Romania for the papal state. In this way the Roman serfs of western Romiosini lost their ecclesiastical ethnarchy, came into a state of illiteracy, believed that the state of Romania is only the papal state, also that the Frankish Pope was still their Roman ethnarch, and the Frankish "emperor of the Romans" was their traditional emperor. At the same time the Franks condemned those they called "Greeks" as being heretics, and in this way managed to cut off the western subjugated Romans from the free eastern Romans, and they taught them to hate the nonexistent "Greeks" or "Byzantines", who were in the truly united nation of the Romans. 15. See J. Romanides, Romiosini, Romania, Roumeli. The reader can take advice from this book in which I further show the results of what is contained in this study. 16. Old English and French lexicons refer to the name "Frank" as meaning "noble" and "free" in contrast to the serfs. This is why Masonry in France and the Ionian Islands is called "Frankish Masonry" while elsewhere it is called "Free Masonry". 17. Panagiotis Chrestou, Αι περιπέτειαι των εθνικών ονομάτων των Ελλήνων ("The Adventures of the National Names of the Greeks"), Thessaloniki 1960, pp. 40-45.